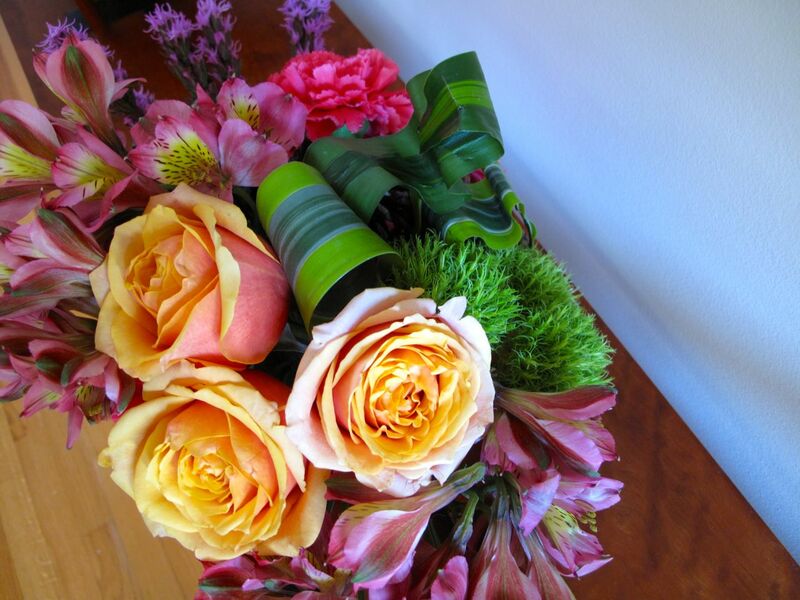 Yesterday I participated in another flower arranging class offered through my garden club. I had missed the January session and November’s lesson seemed long ago. It was fun to get back. This two-hour workshop was titled Creative Mass Design. Among other characteristics, the use of bold colors typifies this kind of design. 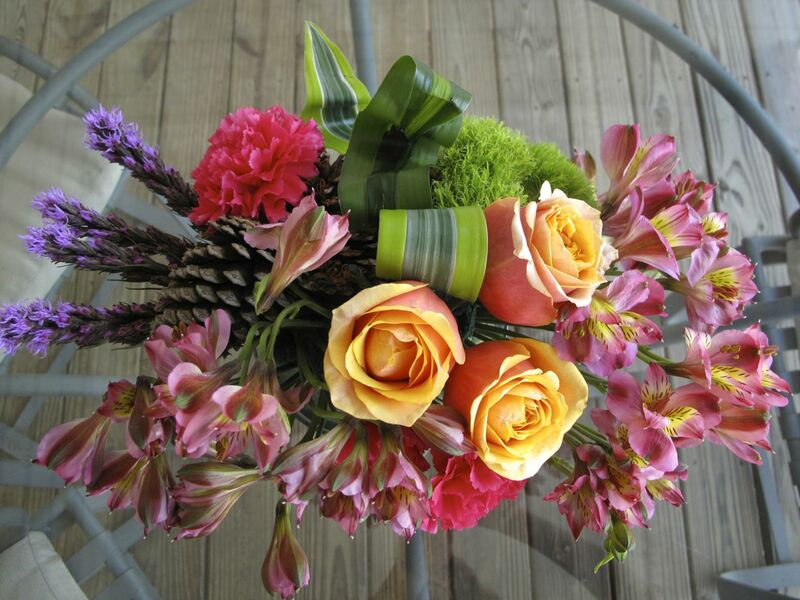 Varying types of flowers are tightly grouped or massed together and constructed without filler materials. Three-dimensionality is achieved through consideration of foreground, middle ground and background. Using examples from our book and pointing out features in her sample creative design floral arrangement, the instructor presented a short lesson on the design principle of scale, and the design element, space. 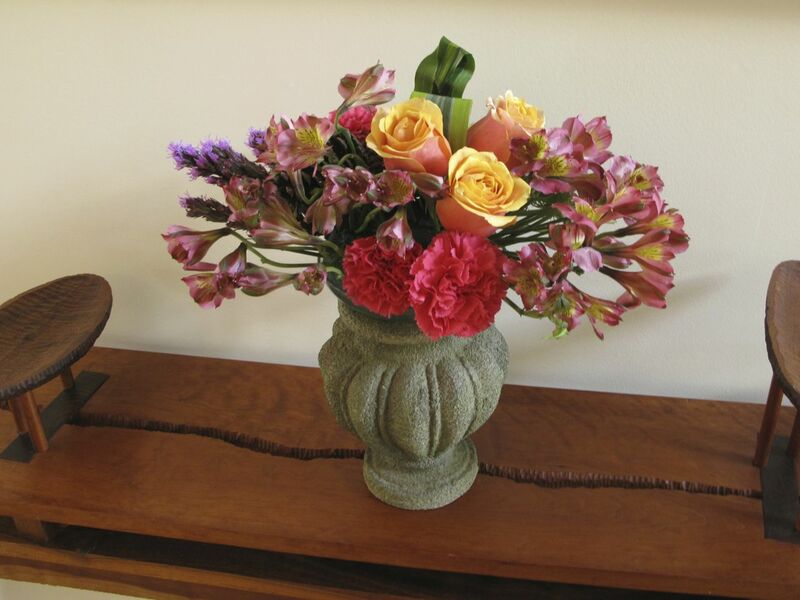 For flower arranging purposes space is the open area in and around the design. During this class we created a closed design. Next we had a hands-on session about manipulating materials. In this case it was rolling and folding yellow and green striped leaves of ‘Lemon Lime’ Warneckii. For this type of design plant materials that have been abstracted by folding, clipping or bending may used in varying degrees. The second hour we were let loose to create our own Creative Mass Design arrangement. There were so many things to keep in mind while working on the design (most of which came to me later, after the class). As with the last session the time passed all too quickly and all too soon it was time to pack up. Photographing the arrangement once I was home helped me study my design, see it differently and analyze it more objectively than when I was working on it in class. Using the images I noticed some things in my arrangement that seemed obviously unresolved, but there were some aspects there I liked as well. I am too much a novice to explain more. It was a fun challenge to work with these particular plant materials to solve a design problem. Floral design is not very intuitive to me, but that is all the more reason for studying the basic principles and elements—it is a journey and I have taken another baby step. This entry was posted in garden and tagged floral arranging, flower arranging, flower design on March 14, 2013 by pbmgarden. I am absolutely hopeless at arranging flowers, and therefore admire such arrangements all the more. I love the colour combination here – the pink tinge to the yellow roses sets off the whole thing. Very pretty! Thanks Cathy. Our teacher selects all the plant materials for us to use so she has given us some help with the colors. She told us the name of the rose but I didn’t get a chance to write it down. A beautiful arrangement! I particularly like the folded leaf — almost like a plaid ribbon. Thanks Cindy. Folding the leaves was interesting–I need to practice more though. I am dazzled by the horizontal mass! The textures & color combination are unexpected and inspired… Thanks for sharing! Jayme, thanks so much for your comment. This was a fun design to work on. I appreciate that Alberto. This floral arranging is going to take me lots of practice. Sometimes a single flower in a vase is all you need–nothing elaborate. Yours are so lovely outside though you’re all set. The colors are wonderful. Thanks for posting. We continue to admire and enjoy your arrangement.